When looking for the best platform to use when it comes to setting up your own standalone website, one of the most recommended website providers to use all across the Internet is WordPress. It’s a “household name”, so to say, among website developers, bloggers, and basically anyone who has tried making a website or blog before. WordPress’ popularity stems from its many advantages, particularly enjoyed not only by those who’ve chosen to use the platform but even to users who are not very knowledgeable about website making in the first place. Adding to this, WordPress is completely free to download, develop and use – plus, there are lots of plugins and extensions made not only by the official WordPress developers but also by third-party developers that look to augment the experience further than what is available for use by the platform. For businesses, its search engine-friendly, which is good for their SEO efforts. And the platform is flexible enough to be used for all kinds of websites that the user needs. When doing your WordPress website for the first time, it’s easy to search up tutorials on what you need to do, what files you should tinker with, etc. But these can get confusing really fast, and if you’re not particularly tech-savvy, it can be a real struggle trying to keep up with the jargons and methodologies that you’ve read. You just wanted a simple, straightforward website – and yet you somehow need to apply all sorts of changes to so many files that you don’t even understand. But in truth, the basics of using and editing WordPress is easy to understand – and it doesn’t have to go to the deeper technical aspects. Adding, moving, or editing a few, simple elements don't require you to have a year of lessons in HTML or PHP, contrary to popular belief. If you’re a simple blogger or just looking for a small space on the vast Internet to publish your content, this is a great place for you to start. But for business owners, no doubt they’re questioning the importance of this. If it’s so easy, why do you need to learn about it? Can’t you just let your developer take care of that? After all, it is their job to do so, right? 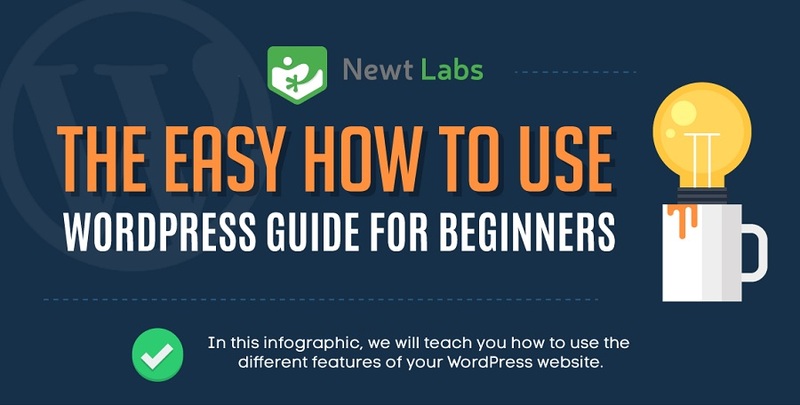 Knowing how WordPress basics work is actually important because it gives you an inkling of what’s happening in your websites, such as errors and missing elements, and if it’s simple enough to edit – thus minimizing the need to contact your developer all the time just for minor edits. As a beginner, what sort of things do you need to know about using different WordPress features and functions? Find out now with below Infographic by Newt Labs.